John Quincy Adams [1767-1848], Quincy, Massachusetts; his son, Charles Francis Adams [1807-1886], Boston, Massachusetts; his son, Brooks Adams [1848-1927], Boston, Massachusetts; his niece, Abigail Adams Homans [Mrs. Robert Homans, 1879-1974]; gift 1954 to NGA. For Mrs. Homans' dates see The New York Times Biographical Service, 24 vols. (and continuing), New York, 1969-, 5:222. Extended loan for use by The White House, Washington, D.C., 1975, 1976. Fathers and Sons: Two Families - Four Presidents, George Bush Presidential Library and Museum, College Station, Texas, 2002, no cat. Gilbert Stuart, The Metropolitan Museum of Art, New York; National Gallery of Art (for the National Portrait Gallery), Washington, D.C., 2004-2005, no. 58, repro. Mason, George C. The Life and Works of Gilbert Stuart. New York, 1879: 125-126. "Portraits Painted by Stuart...taken from Mason's Life and Works of Gilbert Stuart." In Exhibition of Portraits Painted by Gilbert Stuart. Exh. cat. Museum of Fine Arts, Boston, 1880: 28, no. 4. Bowen, Clarence W., ed. The History of the Centennial Celebration of the Inauguration of George Washington. New York, 1892: 144, repro. opp. 260, 426. Park 1926, 93, no. 7, repro. Oliver, Andrew. Portraits of John and Abigail Adams. Cambridge, Massachusetts, 1967: 132-140, fig. 66, 251, no. 105. American Paintings and Sculpture: An Illustrated Catalogue. 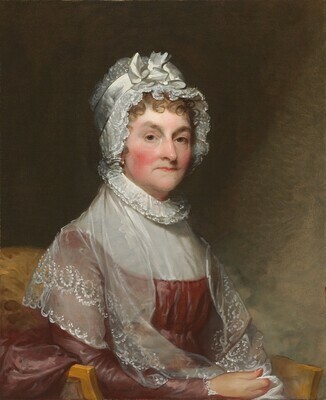 National Gallery of Art, Washington, 1970: 102, repro., as Mrs. John Adams. Van Devanter, Ann. "The Signers' Ladies." Antiques 108, no. 1 (July 1975): 120, color repro. 116. Walker, John. National Gallery of Art, Washington. New York, 1975: 387, color repro. American Paintings: An Illustrated Catalogue. National Gallery of Art, Washington, 1980: 227, repro. Williams, William James. A Heritage of American Paintings from the National Gallery of Art. New York, 1981: 67, repro. 70. Walker, John. National Gallery of Art, Washington. Rev. ed. New York, 1984: 383, no. 543, color repro., as Mrs. John Adams. McLanathan 1986, 112, color repro. American Paintings: An Illustrated Catalogue. National Gallery of Art, Washington, 1992: 356, repro. Miles, Ellen G. American Paintings of the Eighteenth Century. The Collections of the National Gallery of Art Systematic Catalogue. Washington, D.C., 1995: 214-216, color repro. 215.